1. The MP4 format may be the optimal choice for reduced file size, but encoded versions may fail to import. In an earlier post, I thought that the MP4 file format would be best used to import long interviews into NVivo due to their relatively smaller size. However, I could not import these files, even though they were under 40MB and in a format approved for import. I did succeed in importing unencoded AVI and WMV files and after struggling to encode other interview files below the 40MB guideline, I succeeded with importing files of 53, 64 and 103 MB files sizes as internal source. In testing imports, I was also reminded of the important practice of always backing up one's source files; these proved useful as a reserve source when subsequent encodings were not convertible to a new format. I used Any Video Convertor to further reduce the video's file size; selecting a smaller video size (220 * 176 from 320 * 240). The resulting video was 27.8 MB in size. 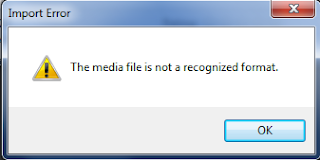 I then tried to import it into NVivo, but received the same generic error message. I then tried to re-encode the reduced file to a WMV file format, as this matched those used for successful imports of Edmore and Khanya's first interviews. However, this conversion failed. I then used my video backup folder to source an earlier .wmv version of the file and converted that. However, it went from being 55.4 Mb to 94.4 MB in size; probably due to fixed audio settings that I could not change, while the screen and video settings could be reduced. Out of frustration, I tested whether I could import an earlier AVI export of the interview and was suprised when a 54 MB file import succeeded. I then tested two WMV interviews with Ace (65 and 105 MB respectively), which were proving difficult to reduce and these imported fine. Today's learnings have raised an interesting question; should I edit my earlier post to be more accurate and useful for other researchers? While this is tempting, it would be misleading and undermine my research blog's ability to show some of the challenges which emerge in the research process. So, I won't updating the post, but I will certainly add a comment warning readers not to follow the problematic step and process! If you agree, or not, please add a comment below. Thanks :) .